The Republic of Ireland have enjoyed mixed fortunes when presented with a play-off route to the finals of major competitions over the years. They have been involved in eight to date and won just three, although they have been successful on each of the last two occasions they have entered the lottery. Here, Press Association Sport takes a look at their fortunes over the years. Ireland and Spain were pitched into battle as a result of Syria's withdrawal from the competition, with a place in the finals in England awaiting the victors. In the event, it was the Spaniards who went through courtesy of Jose Ufarte's first international goal in a 1-0 win in Paris. Jack Charlton's hugely successful spell as Ireland manager entered its death throes as his team missed out on a trip across the Irish Sea once again. A young Patrick Kluivert did the damage, scoring both goals as Holland prevailed with a 2-0 victory. The Republic got off to an encouraging start when Denis Irwin fired them into an early first-leg lead, but Luc Nilis' equaliser ensured Belgium returned home with something to show for their efforts, and there was more to come. Luis Oliveira and Nilis both struck again in Brussels to make Ray Houghton's effort largely irrelevant, with David Connolly's sending-off simply rubbing salt into Irish wounds. Robbie Keane gave Ireland the upper hand in their showdown with Turkey, but it was Tayfur Havutcu's late penalty at Lansdowne Road which eventually proved decisive. After a tetchy build-up to the return leg in Bursa, the sides fought out a stalemate and the Turks progressed on the strength of their away goal. Having missed out on automatic qualification to Portugal on goal difference, the Republic were determined not to see another tournament slip from their grasp, and this time they made no mistake. Goals from Ian Harte and Robbie Keane gave them something to defend in Tehran despite Roy Keane's absence, and Yahya Golmohammadi's stoppage-time strike was not enough to deny the visitors their place in Japan and South Korea. On a night which will live long in the memory for the Irish nation, Giovanni Trapattoni's side were denied a chance to clinch a trip to South Africa in controversial circumstances. Trailing 1-0 from the first leg in Dublin, Robbie Keane fired them back into it in Paris before William Gallas levelled in extra-time, but only after Thierry Henry, unseen by the officials, had handled during the build-up. Having suffered so much disappointment in the past, Ireland left nothing to chance on this occasion as they made the most of two red cards to thump Estonia 4-0 in Tallinn with Robbie Keane netting twice. 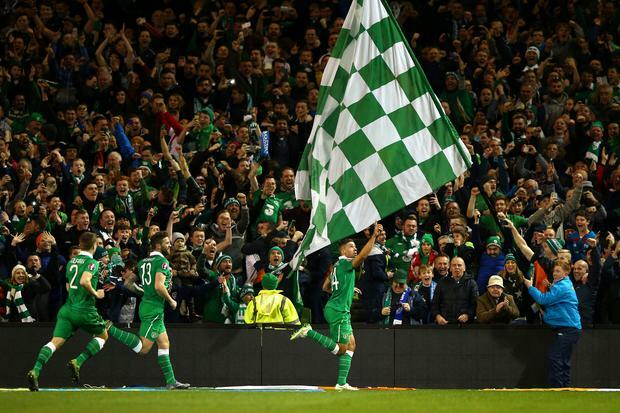 A 1-1 draw at the Aviva Stadium in the return proved something of an anti-climax, but the Republic had already effectively booked their trip to Poland and Ukraine. Martin O'Neill's men returned from a foggy Zenica disappointed to have seen Edin Dzeko cancel out Robbie Brady's first-leg opener, but confident they could make it to France. Their hopes were boosted when Jonathan Walters converted a fortuitous penalty, and they were home and dry when he dispatched a volley past former club-mate Asmir Begovic with 20 minutes remaining.